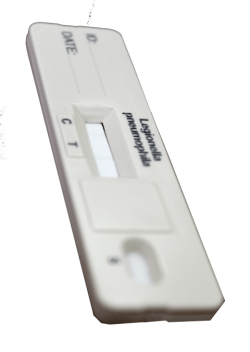 The H. pylori saliva test is a one step immunochromatographic assay for the rapid detection of H. pylori antigen in human saliva. Physicians currently diagnose H. pylori infections with endoscopy, blood tests and breath tests.  Endoscopy, the gold standard is invasive, expensive and can miss H. pylori infections if a biopsy sample from one part of the stomach does not contain the bacteria. Blood tests detect antibodies to H. pylori, but these antibodies can persist for up to a year after the bacteria are eradicated, making it impossible for physicians using blood tests to quickly determine if a patient’s treatment succeeded. Breath tests capitalize on the fact that H. pylori contains abundant urease and can rapidly metabolized urea, releasing CO2 and NH3. To perform the test, physicians have their patient swallow a capsule full of urea labeled with the radioactive isotope C14. If the patient has an H. pylori infection, the bacteria will metabolize the urea and soon the patient’s expired CO2 will have a higher than normal concentration of the radioactive carbon isotope. To collect the labeled CO2, the patient breathes into a mylar balloon. The laboratory can quantitate the number of C14 counts with a liquid scintillation counter. Breath tests have their disadvantages in that the equipment is very expensive and not available in some cities as well as can miss H. Pylori in oral cavity and esophagus. 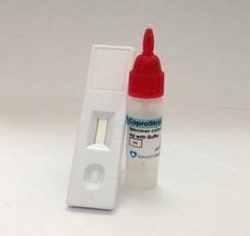 The H. pylori saliva test is an immunochromatographic assay, which utilizes unique antibodies to selectively identify H. pylori in saliva for oral infection.